Is it true that Scorpions flouresce under ultraviolet (UV) light? Yes, all scorpions fluoresce under UV light (also known as "blacklight"). Longwave ultraviolet light is reflected as visible light in the green range. In darkness, the scorpions appear to glow. 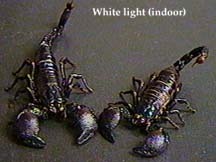 Under direct sunlight, the fluorescence may impart a greenish tint to the scorpion's color. The fluorescence is caused by an unidentified substance in a very thin layer in the cuticle of the scorpion called the hyaline layer. Newly molted scorpions do not fluoresce. As the new cuticle hardens, the fluorescent quality increases. 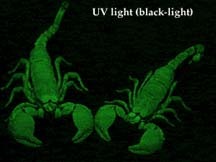 This indicates that the fluorescent factor is either secreted by the scorpion shortly after molting or that the fluorescence is a by-product of the tanning process. Alcohol in which scorpions have been preserved may also fluoresce. The hyaline layer of the cuticle is very tough stuff. It is often found in scorpion fossils. Even after hundreds of millions of years, while all the other layers of the cuticle have been lost, this hyaline layer remains embedded in fossil rocks. And yes, it still fluoresces. Nobody knows the function of the hyaline cuticle or its strange fluorescence. Some have suggested that it serves as UV sensor (all scorpions are basically nocturnal and shun the light). This unusual feature can make scorpions easier to collect and observe. 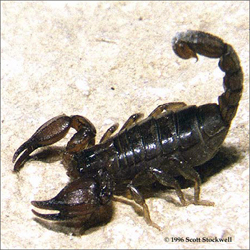 When darkness falls, portable UV lights can be carried into the field where scorpions live. Scorpions caught in the nearly invisible UV light glow an eerie greenish color, making them easy to spot in the darkness. 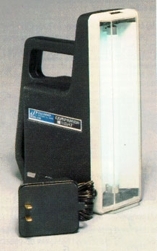 In the 1980s we used a neat battery powered lantern called a "Safari Lite." They were fluorescent lamps powered by two 69 volt batteries. We replaced the ordinary fluorescent tube with a UV tube and we were in business. The Safari Lite put out some strong light. You could see scorps, even small ones, at 15-20 meters if it was really dark out. To the best of my knowledge, they stopped making the batteries (which were quite expensive and not rechargeable). Most recently, I have used a rig designed for inspecting leaks using fluorescent indicators. I purchased my "Watertight UV Lamp" system (L-00295-00) from Cole-Parmer Instrument Company. 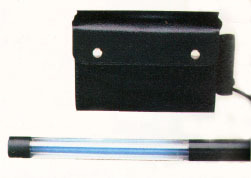 The system runs off of two 6-volt lantern batteries and has a watertight fluorescent UV wand. The wand is completely sealed so the UV tube cannot be replaced (bummer). I had to fashion a sheet metal reflector to keep the light from shining on me (the wand provides 360 degree illumination), but other than that it worked fine. When I bought it it was US$45.00, but check with them for availablilty and pricing. I also found that my older rigged-up UV wand from BioQuip could run off of the same power supply. Bioquip (BioQuip Products, 2321 Gladwick Street, Rancho Dominguez, CA 90220, USA; Phone: (310) 667-8800 Fax: (310) 667-8808; email: BioQuip) also sells a UV light wand and rechargeable battery packs (Catalog Number 2813B and 2813C for the light wands; 2860 and 2861 for the rechargeable battery packs). These are a little more expensive than the Cole-Parmer rig, but are of similar design. I have also used a couple of other camping lanterns. They have the same design as the old safari light, but run off of two 6-volt lantern batteries or rechargeable batteries. The 12-volt system worked well, but the rechargeable system was a little under-powered. Cole-Parmer Instrument Company used to sell a rechargeable lantern. You should check with them for availability and pricing. You generally have to find a really good camping or army surplus store to pick up one of the six volt models. Just remember that the UV tube has to be of the "blacklight" (long-wave) variety, not of the germicidal variety used in a lot of scientific applications.